The win took Puneri Paltan to the top of the Zone A standings with two wins in two matches while Dabang Delhi have won just once in three matches to be placed third. Kabaddi sees its share of ferocious tackles and raids with players fighting tooth and nail for each and every single point. Over the years, Pro Kabaddi has grown even more competitive and that can be understood with the rising number of teams in the tournament that has gone up to 12. The activity too gets intense as the season moves forward. One such instance came on the first day of the Nagpur leg of action in the PKL. On the day that Bengaluru Bulls beat Tamil Thalaivas in a thriller which started off with a dominant start by the Bulls before Thalaivas got back in the second half to reduce the gap. In the end, Bengaluru won 32-31. 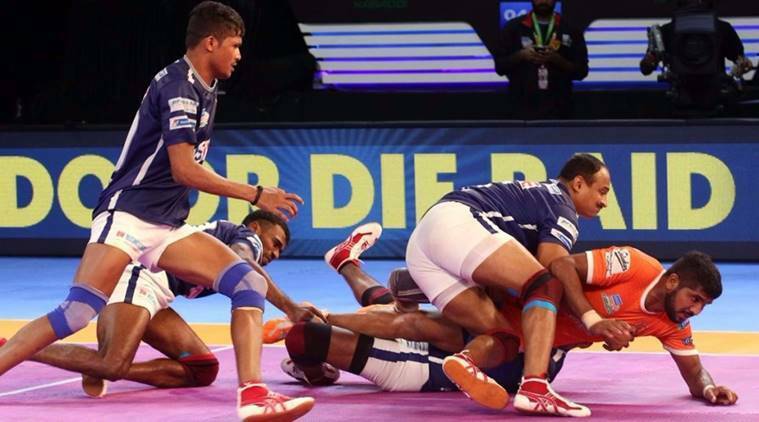 In the second match of the day, Puneri Paltan got the better of Dabang Delhi in a 26-21 contest that was neck-and-neck till the half time break before Pune drew lead with steady play to win. Even though they lost, Delhi, especially Nilesh Shinde, recorded one of the moments of the game or even made a mark for the moment of the league this season when he caught Sandeep Narwal napping in the eighth minute of the second half. As Narwal stepped up to go for a raid and try and eat up the 30 seconds allowed while hoping for a mistake by the Delhi players, he made a mistake of his own. As he moved backward, he lost focus and let the Shinde drop from his eyeline. The veteran noticed that and tip-toed his way to the midline and came back from behind to catch Narwal napping for one remarkable tackle.